Photo Archive: Sentry, Museum of The Dragoon Guards, Tower Street, York, May 2014. Posted by Mr. B Flaneur in Photo Archive., Yorkshire. The View from the Roof of The Keep Military Museum, Bridport Road, Dorchester, 07/07/15. Posted by Mr. B Flaneur in Out and About. 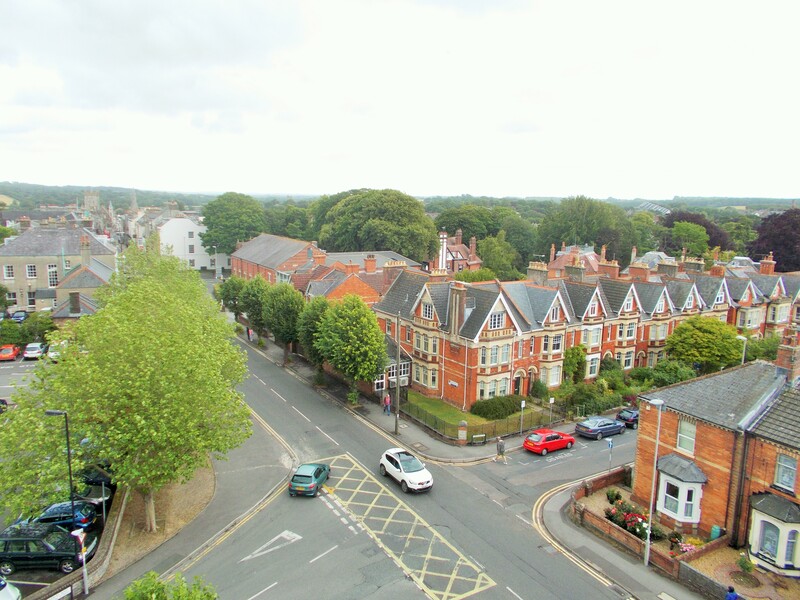 The view looking towards the junction of Bridport Road and Cornwall Road. On the roof of The Keep. 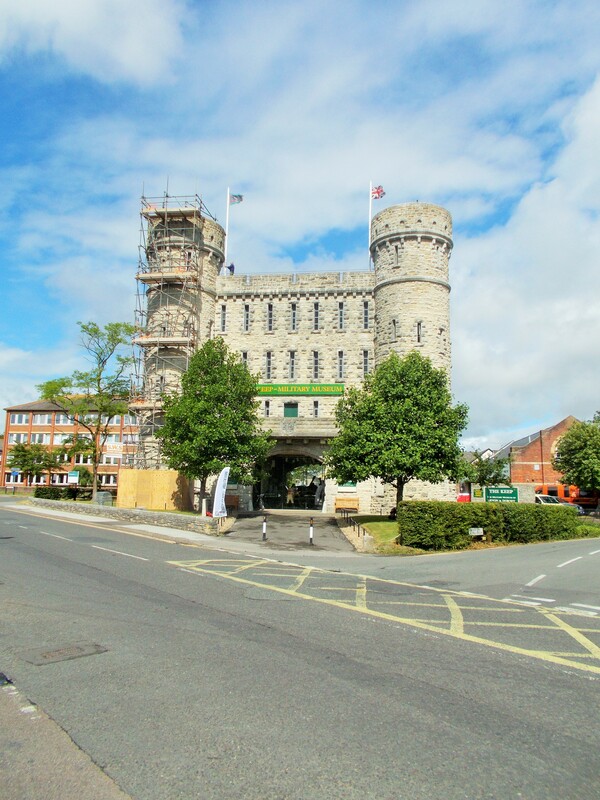 The Keep Military Museum’s own website quotes a description of the building by the well know art and architectural historian Pevsner, who describes it in less than favourable terms: “The monumental gatehouse is a knock-down affair. Two round towers to the front, the archway between. Three storeys of long slit windows. Rock faced with a vengeance. Today it is a grade 2 listed building. The designer was probably Major AC Seddon R.E, head of the War Office Design branch at this time…The barracks behind were humble by comparison“. As somebody who grew up by the seaside, The Keep reminds me of the castle shaped plastic buckets and the resulting crenelated sand castles they produced. 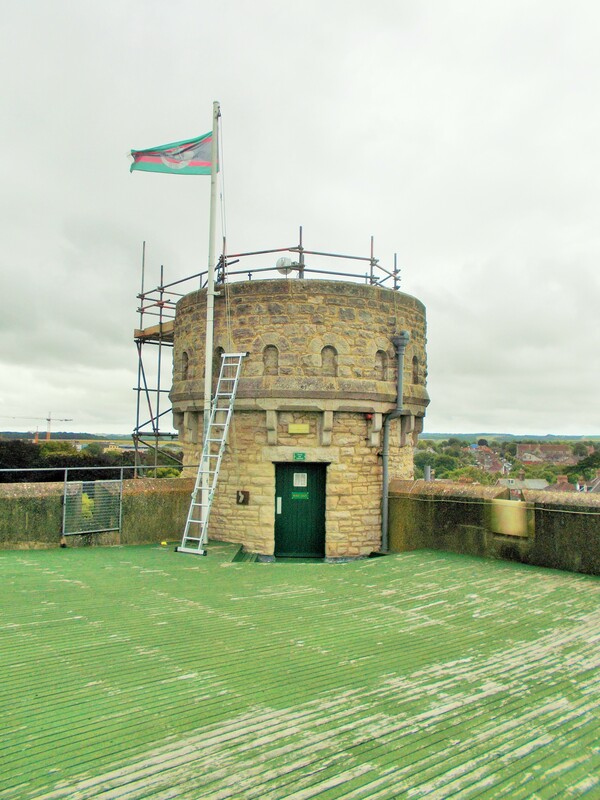 The Keep is topped with two flags, the Union flag and the flag of The Rifles. In 1958 the Devonshire Regiment and the Dorset Regiment amalgamated to form the Devonshire and Dorset Regiment. In 2007 the Devonshire and Dorset Regiment was amalgamated with a number of other regiments to form The Rifles, which still has a Reserve Company [the Territorial Army as was] based Dorchester. 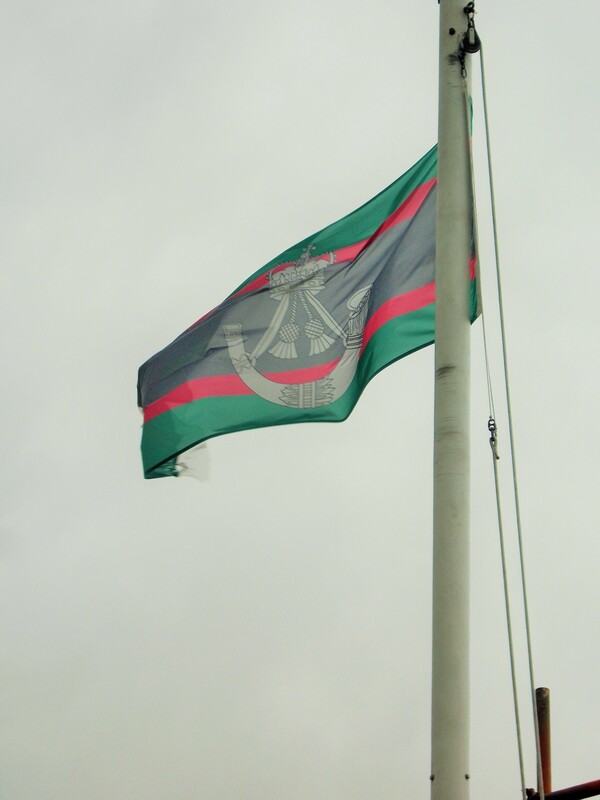 The flag of The Rifles. The spiral staircases in the towers give access to the museums galleries on three floors and then you are invited carry on and step out onto the roof. It was a rather windy day and the situation was unique in my experience, in that the area of the roof is very large, but the battlements around it are very short. The two gentlemen working on the maintenance of the tower didn’t seem to mind climbing up even higher and out onto the scaffolding you can see on my photographs, but one of them did remark to me that, “It was a bit windy”. The Keep is tall enough for you to get a unique perspective on a number of tree tops and the comings and goings of the Bridport Road. The military museum itself is very interesting and, if you like heights, I would recommend a walk on the roof. Parachute Regimental Association Wreath, Entrance to The Airborne Memorial Garden, Castle Hill, Lincoln, 26/6/15. I have spent the last hour looking at cap badges on-line and I’m still not entirely sure which one this chap is wearing! I think it is the cap badge of the Prince of Wales’s Own Regiment of Yorkshire, created in 1958, with the amalgamation of two Yorkshire based Regiments and has since been amalgamated with two more regiments to form the Yorkshire Regiment. 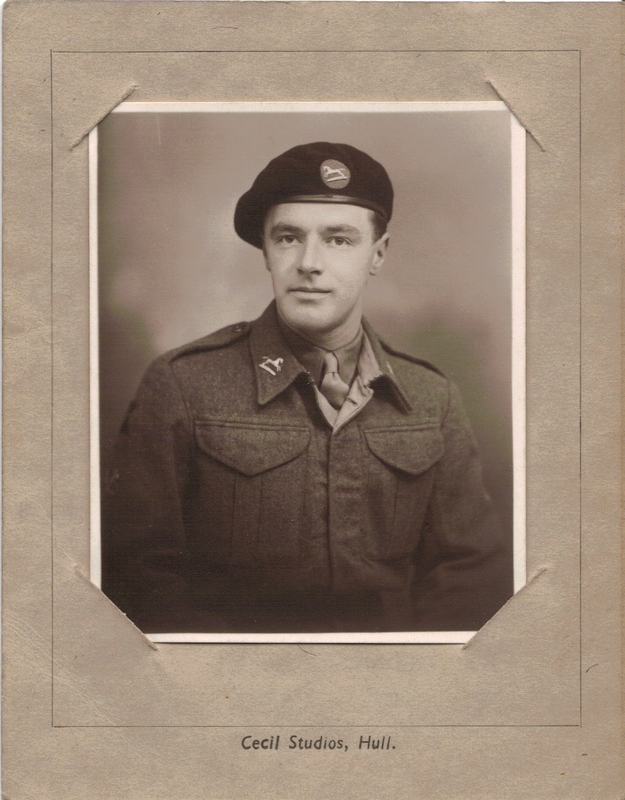 I can’t make out the Divisional insignia on his right sleeve, but I think the badge below depicted crossed sabres, the badge of the British Army’s physical training instructors. Sadly, I haven’t been able to find out anything regarding, “Cecil Studios, Hull“. Pulman Street and Evans Square Roll of Honour, Streetlife Museum of Transport, Hull, 29/11/14. This is one of three memorials now displayed at the Streetlife Museum of Transport. The two other Rolls of Honour or Street Shrines are rather large, Gothic, dark, wooden affairs, so this one stands out considerably in comparison, with its names clearly displayed in black and white. I became curious to know if I could find out anything about these men and their service in World War One, so I took this photograph on Saturday morning and I have spent my Sunday evening researching; largely with the aid of www.ww1hull.org.uk. 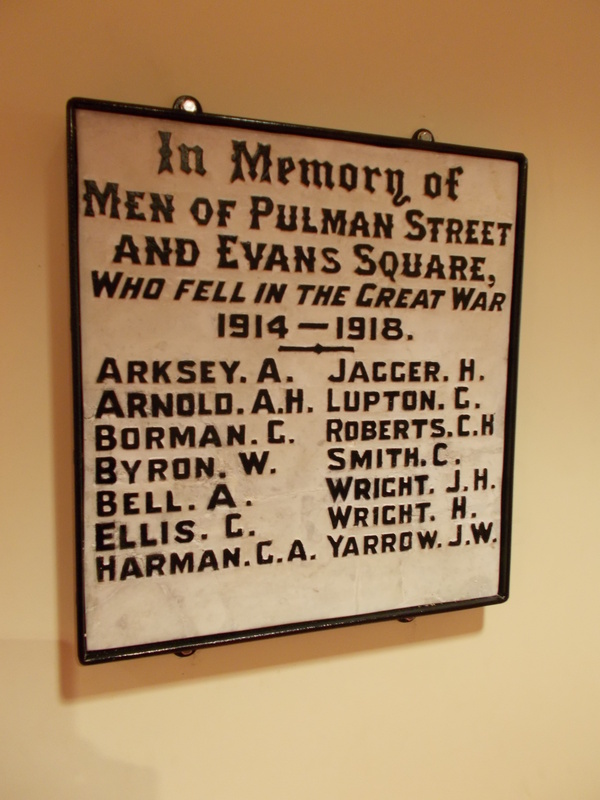 Sergeant Albert Arksey MM and Bar (33399) gave his address as 23 Pulman Street when he joined the 11th (Service) Battalion of the East Yorkshire Regiment on the 1st November 1917. By the 28th June 1918 he had won his Military Medal and was promoted to the rank of Sergeant. On the 6th September 1918 he was killed by a German sniper after only 10 months service. Arksey also appears on a list of railway employees, published by the National Railway Museum, who lost their lives in World War One, so we know that he worked as porter with the North Eastern Railway and that his death was reported in the North Eastern Railway Staff Magazine for November 1918 (page 208). Corporal Gilbert Lupton (10453) served with the 4th Battalion of the Coldstream Guards and died on the 20th January 1918. George Alfred Harman (7753) joined the 8th (Service) Battalion of the East Yorkshire Regiment, one of the eight Kitchenner battalions raised in the August of 1914, and George William Yarrow joined the 11th (Service) Battalion known as the “Hull Tradesmen“. Three of the men joined the Northumberland Fusiliers. George Holmes Ellis (5498) served in the 19th (Service) Battalion, the 2nd Tyneside Pioneers, raised in Newcastle on the 6th November 1914. George Borman (3881) and Harry Wright (242265) both served in the 4th Battalion, which was a Territorial unit originally based in Hexham. Harry Wright’s brother, Lance Corporal John Henry Wright (21725), died serving with the 7th Battalion of the East Yorkshire Regiment. The other names seem to have been lost to history, apart from C Smith, whose initial and surname are so common that my research discovered 607 possible Smiths. 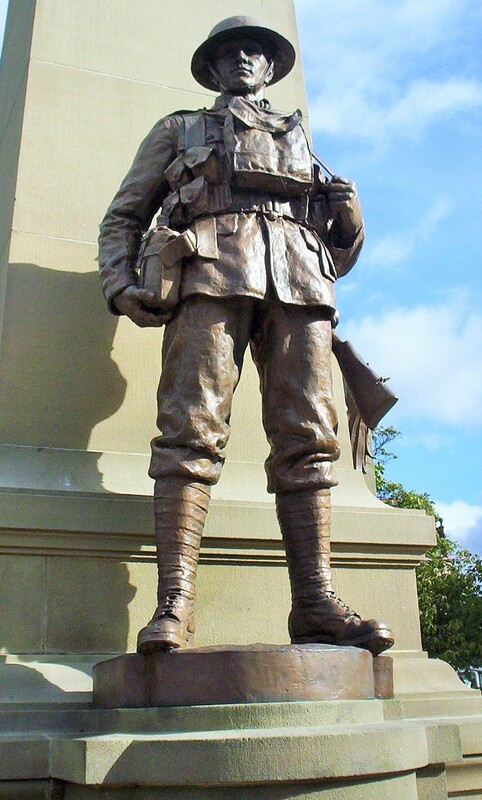 Photo Archive: Keighley War Memorial, Keighley, 01/10/05. Their name liveth for evermore“. 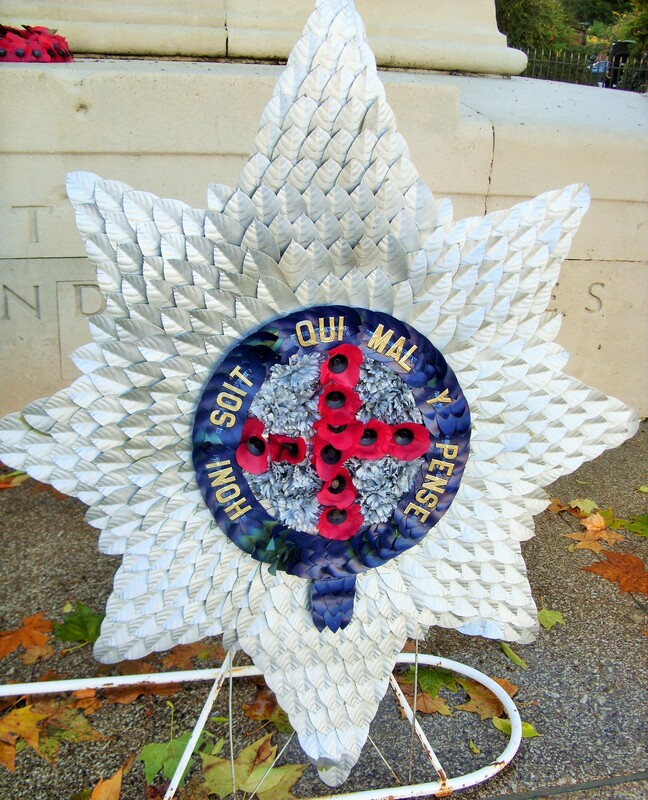 Photo Archive: Wreath, The Guards Memorial, Horseguards Parade, London, 21/11/10. “Honi soit qui mal y pense” (Shame on him who thinks evil of it). 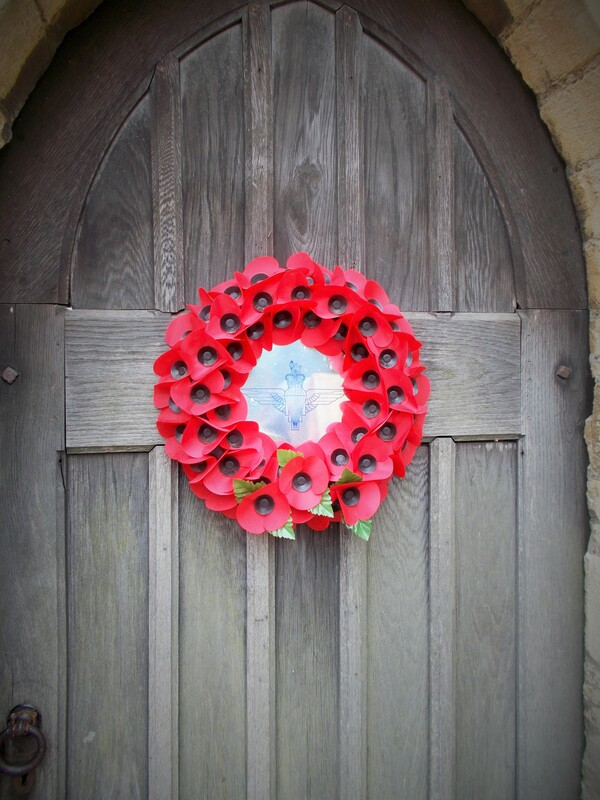 This memorial wreath takes the form of The Star of The Order of The Garter, with poppies forming the Cross of St. George at its centre. The Star, as well as being the heraldic symbol of Britain’s highest order of chivalry, is the regimental insignia of the Coldstream Guards. The losses of all five Regiments of Foot Guards are commemorated as part of The Guards Memorial, alongside those of the units that made up the The Guards Division, who lost their lives in World War One and “in the Service of their Country since 1918″. The memorial faces Horseguards Parade, the large parade ground in Whitehall, where The Guards troop their colours to mark The Monarch’s official birthday every year. My maternal grandfather was from Coldstream, the ancestral home of the Coldstream Guards, so I have always had a bias towards the Regiment (and that’s why you’re not looking at a wreath shaped like the cap badge of The Grenadier Guards). I’ve written about the Coldstream Guards memorial in Henderson Park in Coldstream before [Photo Archive: Henderson Park, Coldstream, April 2012] and this insignia has appeared in more unexpected places on my travels [Coldstream Guards Hassock, St. Mary’s Church, Beverley, 14/05/14]. 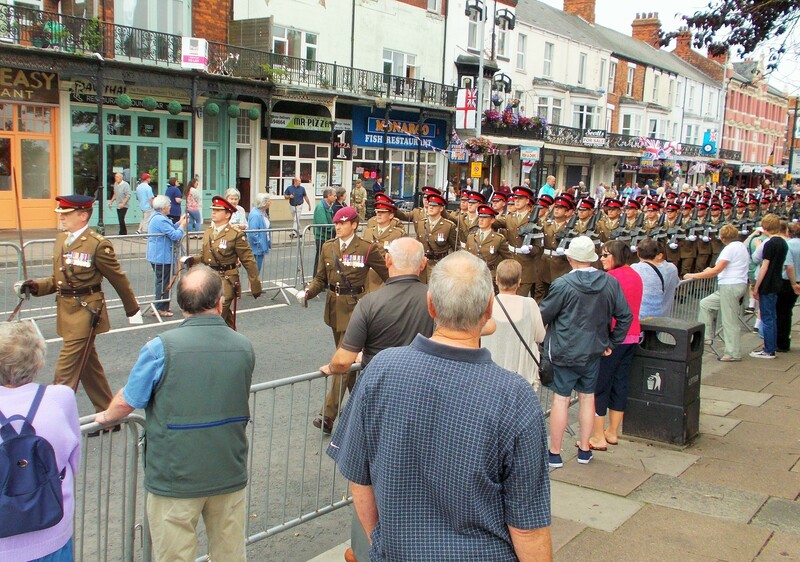 “The Poachers”, 2nd Battalion, The Royal Anglian Regiment, Cleethorpes, 23/07/14. Posted by Mr. B Flaneur in Cleethorpes. North East Lincolnshire. The Poachers marching along Alexandra Road. 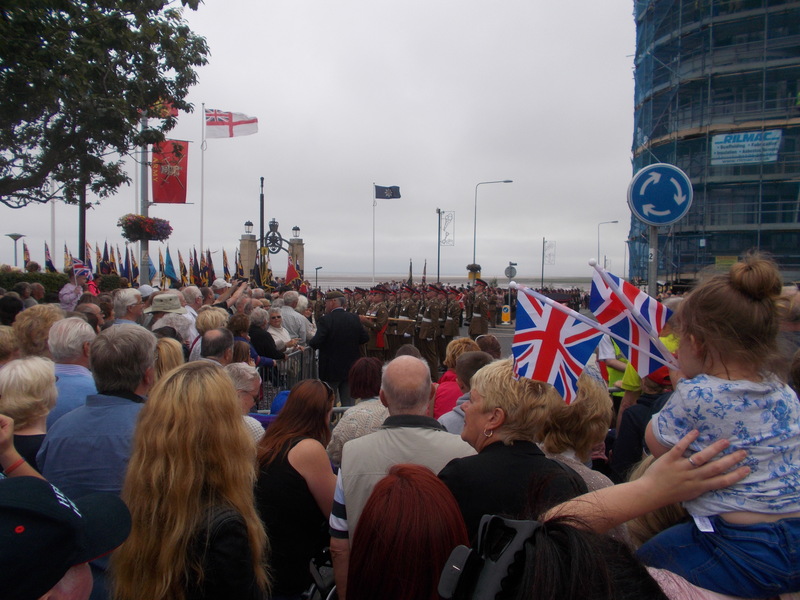 I only found out that The Poachers would be exercising their freedom of Cleethorpes the day before the parade was due to take place, but as it happened I had the day off work and was able to attend. 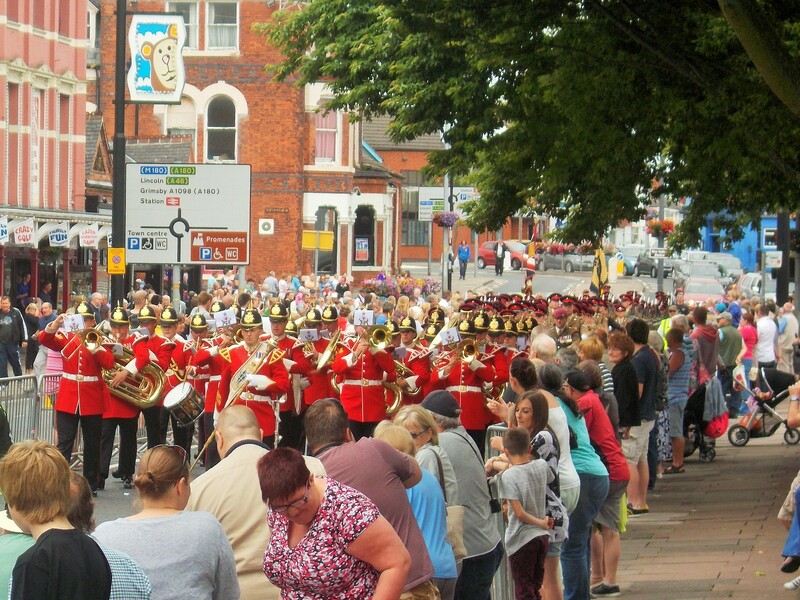 Two Companies of the Regiment marched down St. Peter’s Avenue, through the Market Place and down Alexandra Road with their band playing, swords drawn, bayonets fixed and colours flying to mark their return from operations in Afghanistan. I ended up watching the parade from quite a quiet section of Alexandra Road (I didn’t see how busy St. Peter’s Avenue was) and it was only after the parade marched passed that I got a more accurate impression of how many people were lining the route, as those lining the roads began to follow The Poachers up to the Memorial Gate, where veteran standard bearers from the British Legion and some flag waving school children were waiting for them. Quite a crowd gathered to hear the various civic and military dignitaries make speeches and every opportunity was taken to applaud. The band played outside the National Westminster bank, but the crowd was so dense that I could not see them, despite their scarlet tunics. 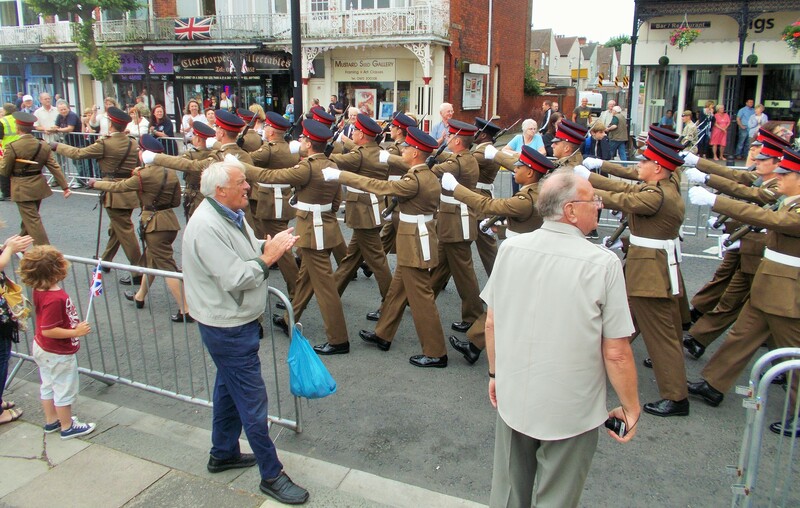 You can read more about the parade in the Grimsby Telegraph: ‘Proud moment’ for Lincolnshire Poachers as more than 100 soldiers parade through Cleethorpes. A War Household or A Photograph of Photographs 17/05/14. 1940s House, British Army, British History, Ephemera, interior design, Military History, old photographs, Photography, pipe smoking, RAF, Royal Marines, Second World War, studio portrait. A photograph incorporating twelve individual portraits, in a range of styles and frames, with enough space left for two vases of flowers and some interesting period features; how could I resist? At some point the photograph has been cropped, cutting off some writing that was on the back; presumably a description of what we’re looking at [curses]. We have been left with the date however; July 1945. Whoever took this photograph must have had a very stressful Second World War with the welfare of what looks like five soldiers, three airmen and a Royal Marine on their mind for the duration! I wonder how they’re all related? Note the soldier who is so addicted to his pipe that he wont take it out of his mouth to have his photograph taken! For those interested in interior design, note the textured wall paper, the rather bulky lock on the door, the bannister rail and the bakelite light switch. Posted by Mr. B Flaneur | Filed under Ephemera. “Come To The Cook House Door” Regimental Portrait. It is a good job the Corporal (front row in the centre) had enough time to get his cap and tunic on ready for this photograph, because that is what caught my initial interest. Regimental badges used to be a big interest of mine and the badge of the Royal Army Medical Corps can clearly be seen on the Corporal’s cap. He also wear the “Geneva Cross” on both his sleeve above his stripes. The rest of the men are dressed for work; perhaps they’ve come straight from the cook house? Note the knife and carving fork in the hand of the chap standing on the left. Is that the cook house door behind them? The back of the photograph is blank. Purchased in Hull: 25th April 2014.